The Prime Minister, Shri Narendra Modi addressing at the statue unveiling ceremony of Swami Vivekananda in Ram Krishna Mission, Kuala Lumpur, Malaysia on November 22, 2015. 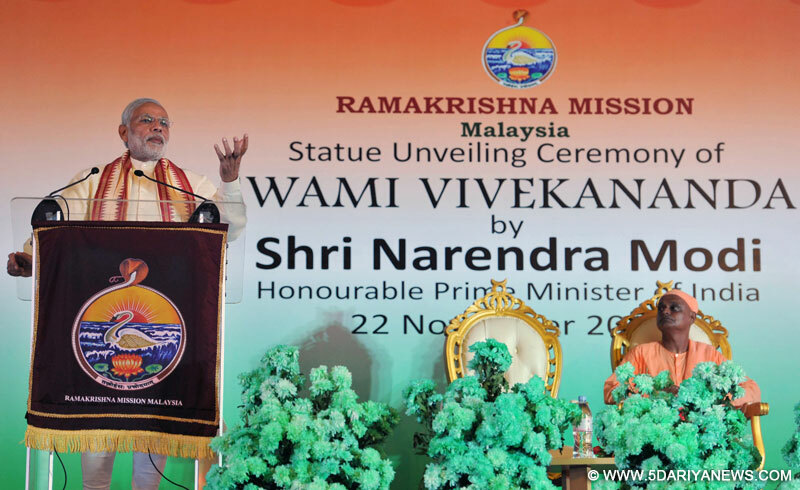 Prime Minister Narendra Modi on Sunday called on people to "install" Swami Vivekananda in their heart and soul.He made the exhortation while unveiling a statue of the Indian sage at the Ramakrishna Mission in Petaling Jaya near here on the second day of his visit to Malaysia. Â“Vivekananda is not just a name. He personifies the thousands-year-old Indian culture and civilisation,Â” Modi said in HIndi after paying floral tributes at the sage's statue.Â“From Vedas to Vivekananda, India's culture is rich,Â” he added.The Ramakrishna Mission complex in Petaling Jaya came up in 2001. Modi, who arrived here on Saturday, attended the 13th Asean (Association of Southeast Asian Nations)-India Summit and then the 10th East Asia Summit on Sunday.Of Malaysia's total population of around 30 million, around two million people are of Indian origin.